1) Cleanouts shall be not more than 50 feet apart, including the developed length of the cleanout pipe, in horizontal drainage lines of 4 inches or less size. Cleanouts shall be not more than 100 feet apart, including the developed length of the cleanout pipe, in horizontal drainage lines of over 4 inches to 10 inches in size. Cleanouts shall not be more than 150 feet apart, including the developed length of the cleanout pipe, in horizontal drainage lines exceeding 10 inches in size. For underground drainage lines exceeding 10 inches in size, manholes instead of cleanouts shall be provided and shall be located at intervals of not more than 150 feet. 2) When it is necessary to conceal a cleanout plug, a readily accessible covering plate or access door shall be provided. 3) A test tee at the base of the stack may be used as a cleanout. 4) A full size cleanout shall be located within 5 feet of the building foundation, inside or outside, in direct line with the building drain and sewer. b) Change of Direction. A cleanout or manhole shall be installed at each change of direction of the horizontal building drainage system greater than 60 degrees; the total of the fittings between cleanouts or manholes shall not exceed 120 degrees. A manhole within a building shall be provided with an iron cover which shall be securely bolted in place and made gas and water-tight with a soft metallic gasket. e) Base of Stacks. A cleanout shall be provided at, or no more than 4 feet above, the base of each vertical waste or soil stack. 1) The building drain shall be extended to the outside of the building and terminated in an accessible cleanout. g) Direction of Flow. Every cleanout shall be installed so that the cleanout opens in a direction opposite to the flow of the drainage line or at right angles thereto, except as permitted in subsection (f) of this Section. h) Cleanout Plugs. 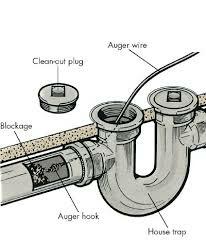 A cleanout shall not have a plumbing fixture installed in it or be used as a floor drain. i) Cleanouts shall be of the same size as the pipe they serve up to a maximum of 6 inches, and at least 6 inches for larger pipe. j) Cleanout Clearance. All cleanouts shall have a clearance of 18 inches for the purpose of rodding.